Introducing Jake's Famous BBQ Hats. Our hat much better than those BBQ Hats on the market which are made in Classic Men's/Women's Classic Baseball Style. 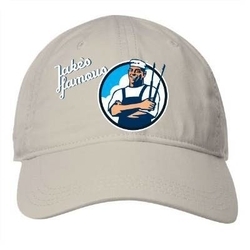 This Khaki Embroidered Classic Tongue Super Clean High Quality Jake's Famous BBQ Hat With Intricate Embroidery features our very own Hottest BBQ Design. This Classic Baseball style cap is made of 100% Cotton. The material has smooth texture, is very soft, comfortable and durable. This Embroidered Hat uses an adjustable Velcro strap to make the most intricate adjustments for this one size fits almost all cap. This hat is perfect for that key Sunday afternoon when you try out one of Jake's Tri Tip Recipes from our eBook 12 Days of Tri Tip barbecue with friends and family. This hat makes the perfect gift for loved ones or for Father's Day. Show your BBQ pride when you try out our exceptional Bourbon BBQ Glaze Recipe with this exceptional quality hat that can be worn at the BBQ, at the game or stylishly on your yacht. The hat is perfect for that warm day at the baseball game. And the hat is excellent for a bad hair day adding warmth or style to a under neglected wardrobe. Buy this hat as an investment increasing your barbecue prowess along with eBooks, BBQ Tools, and accessories for your grill. I oftentimes take the hat and curve the brim not so much for the coverage over the fact but simply because I like the ability to be able to make the hat look increasingly stylish as an accessory to my wardrobe. I find that the fabric of the hat is breathable and really helps wick away any moisture and the opposite is true in keeping the head warmer in cooler months. The neutral color is excellent in that Khaki can be worn with almost any item of clothing. The colors on the embroidery are bold and vibrant and can be seen from at least 10 feet away. This is a great bbq hat that will prove its value long after you remove your last piece of barbecue or start your first piece of baby back ribs. Wear this Jake's Famous hat if you're a runner. The hat is the perfect piece of head gear for the running conscious individual. Because the hat is made of cotton it cools naturally allowing the runner to feel less heat buildup over the head and doesn't restrict when focusing on being fit and trim. The rear strap is adjustable and allows the hat to fit snugly without having a metal clasp digging into the back of your neck. This hat is exceptional for great weather, foul weather or average weather and will stay where you put it and where it belongs on your head. This BBQ hat makes an excellent gift for yourself or for Father or Mother's day. Get this hat today and take advantage of all the benefits. **Note image shown is Gray Hat with Silk Screened image which is a representation of the Khaki Hat with 3000 Stitch embroidery.